In November 2013 Super Typhoon Yolanda (Haiyan) tore through the Western Visayan region of the Philippines. While official reports vary, it is estimated more than 10,000 people died, 30,000 people injured, more than 1 million homes flattened and $460 million (USD) worth of agricultural crops destroyed. To be honest I don’t have a lot of memories of my initial reaction to the news, or response or even the preparations for volunteering: so much change has happened in me since then. All I can say is that something about the news of that typhoon grabbed me and compelled into action, to volunteer. I didn’t go to the Philippines necessarily intending to help women but that’s what ended up happening. When I first learned about Typhoon Yolanda I vaguely remember googling something like “volunteer typhoon Philippines”. 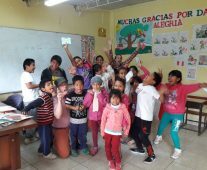 I responded to one of those ‘voluntourism’ type projects as it seemed a safe way help out; working on a building site repairing damaged school classrooms. To be honest I thought I’d have a technology-free 4 weeks and lose a few kilos while working. Before I knew it I was arriving in Manila (along with 11 other volunteers) undergoing a brief induction and then being transferred by bus and ferry down to the municipality of Estancia: a rural fishing community where the typhoon had struck with ferocity. I knew quite quickly that the volunteer experience I had chosen wasn’t the right fit for me. It wasn’t necessarily the fault of the volunteer organisation, I just wanted more than a feel-good tourist experience where the wants of the well-meaning travellers were often given higher priority than the project itself. I watched helplessly in March 2014 when the makeshift home of this family burned to the ground. They had lost almost everything in the typhoon and what little remained was incinerated. We were reunited 4 months later where I found them living in a housing compound in the next village. Our project was rebuilding damaged classrooms and I became frustrated every time work halted while the local foreman took one of the volunteers to the market to replace their lost insect repellant or the group deciding to have a cultural night and the ingredients could only be sourced from the city (a two hour drive away) and everything stops again. I’d been in Estancia a bit over a week when one day instead of going drinking with the other volunteers I asked to be dropped off at the ‘tent city’. The tent city was an emergency housing compound created on a school oval, and at its height was sheltering over 100 families. I didn’t really have a plan just my guitar strapped to my backpack. After settling onto a lump of wood in the dirt I pulled out my guitar and began some songs. Within a few minutes a small group gathered, then from somewhere a chair had appeared and suddenly I had an audience of about 40 or 50 (mainly women and kids) squatting or standing, singing along. Making conversation afterwards with the local ladies I learned there was one larger tent, central to camp which was used as a space for women and children and I offered to return on the weekend and co-ordinate a creative activity. 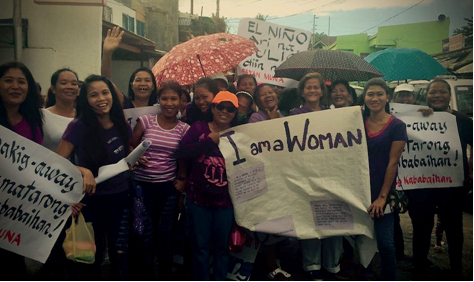 Presenting women’s poetry and affirmations in English and Hiligaynon at the International Women’s Day 2016 celebrations in Estancia. 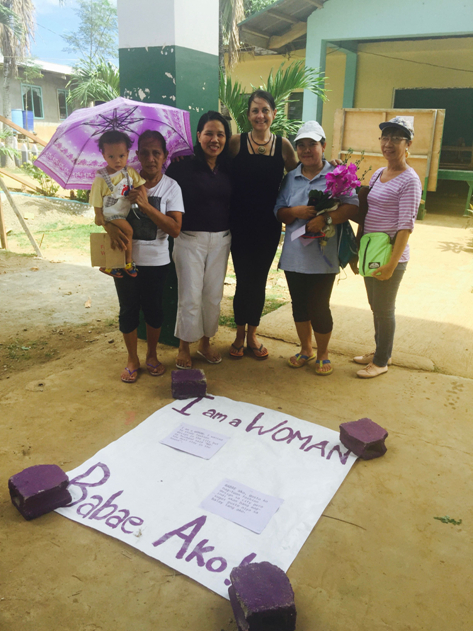 Pictured here with my core group of ladies from Barangay Botongon. I went back the following Saturday after purchasing crayons, coloured paper, colouring books, glue, glitter and similar stuff. I was excited about interacting with the kids but was really surprised when I noticed the local women volunteers and mothers were enjoying colouring-in and drawing as much or even more than the children. I was still working at the school but I kept going back week after week each time bringing new materials. Estancia is an isolated place at the end of the bus run in both directions: supplies are limited at the best of times. But at that time (just after the typhoon) it was really scratchy what you could buy. I remember one week finding these cheap little water colour paint sets but no paint brushes, so I bought 60 toothbrushes to use instead. After a while it was the women who kept drawing me back. Talking (learning to speak Hiligaynon), interacting, eating, socialising with those ladies; I would learn more about the difficulties of their lives over the next three years. Hard, hard work in the fields or filleting fish, carrying boxes, cooking, raising kids, washing all the clothes by hand, drawing water from the well, cooking over a fire or outdoor charcoal stove and then being kept under strict rule by their husbands and certainly not permitted pursue any creative pursuits. It drew me closer to them. I finished my contract with the volunteer agency and moved to a boarding house close to the tent city. I visited the women and kids nearly every afternoon at the same time becoming involved with a local aid agency, learning about their projects and performing at some local women’s gathering. I stayed there for over 2 months returning home only when I had spent literally everything on gifts of food, medicine, drinking water and building materials. After fundraising back in Australia, I arrived back 5 weeks later for my second trip. I discovered the tent city had been disbanded and the families dispersed into different housing compounds a long way away from the town hub. I reconnected with a local aid agency asking how I could be of service and became involved in a women’s cooperative and livelihood project. After meeting with 25 women who had all been deeply affected by the typhoon, I was surprised they were all really interested in my blog and keen on me interviewing and photographing them. These ladies waited literally years for financial aid (some have still not received a single peso) and at that time it was really important to them that someone (even if it was just a white woman with an little iPhone camera) was willing to listen to their stories and hear their voices. 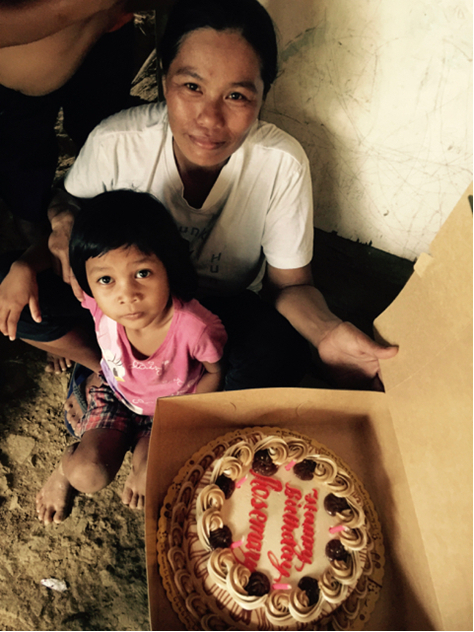 I love giving kids birthday cakes and this was exciting for mother Neda to have a cake for her daughter Rosemary. They invited me to their homes and I spent the next few months assisting them complete a funding proposal for a mobile catering operation that would provide income and employment to many of them. At the same time I helped them go to the doctor, accompanied them and their children to hospital asking the questions they were too afraid to ask, or just hanging out. Becoming friends. They cooked for me, involved me in the lives of their children and invited me to family gatherings and worship. It was really cool when the catering business actually started and they started earning money. My initial trip of 4 weeks extended to 9. Then a second trip, a third, fourth and suddenly three years have passed and here I am living in the Philippines in the process of adopting a little boy and now a real part of the lives of those 25 women I met back in 2014. I’ve been involved in so many projects (both with aid organisations and independently) that it’s way beyond the scope of this little blog post to list them all (plus there’s been a lot of mistakes too). But I really want to reach out to anyone reading this to say, you can do it too. 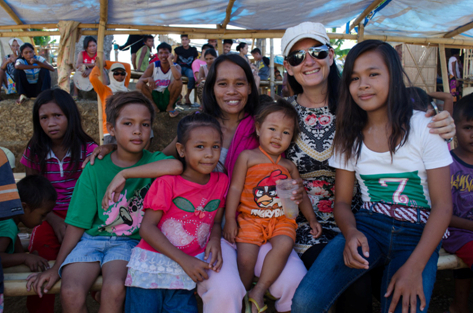 Forging real friendships with the women of Estancia has been one of the greatest joys of my volunteer experiences. Here I am handing out free ice cream with my friend Rowena. I know that not everyone has the capacity to go to a foreign country, but truly you don’t need to. I have come to realise how the greatest help I gave was not money or food or water or medicine it was the friendship and the capacity to listen and share. The volunteer experience has certainly been the catalyst for so many changes within myself. Most powerfully, the realisation that a change has occurred within yourself about the way you treat yourself as a woman. That your standards have been raised and there are now things you are no longer willing to accept for yourself or for women anywhere. 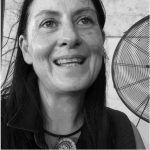 Melinda J. Irvine is an Australian writer, poet and musician living between the Philippine Western Visayas and her home country. 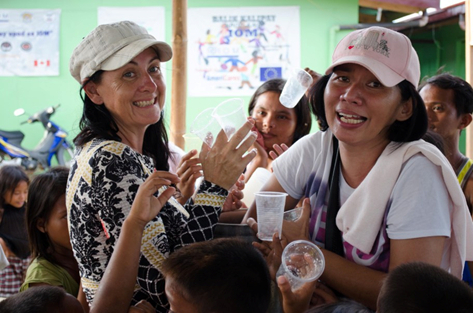 Mel spends her time living in the Philippines with her adopted son Jerry, helping the women and children of Jerry’s home purok (district): a fishing community deeply affected by poverty and seasonal typhoons. Back home in Australia you can find her busking the streets with her guitar, performing poetry and song in a hotel; or you might just find her wandering the broad Australian landscape gathering photos and stories or scribbling out a poem. She can be found online at her blog, Facebook, LinkedIn, or Twitter.